In a 6 quart pot, add Slap Ya Mama Etouffee Sauce, shrimp, crab and crawfish. (If you don’t have access to crawfish, you can substitute with ½ pound more of shrimp or crab). Add ½ cup of water. Bring to a light boil, cover and let simmer for 15 minutes stirring occasionally. Remove from heat and let rest. Bring a large pot of water to a rolling boil. Cook lasagna noodles in boiling water for approximately 12 minutes. To assemble, spread half of the etouffee sauce mixture in the bottom of a 9” x 13” baking dish. 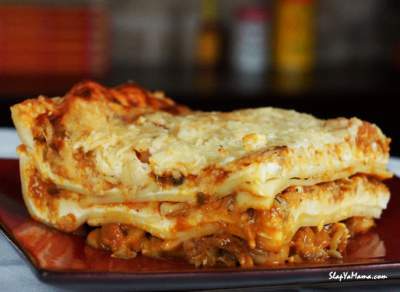 Arrange 6 lasagna noodles lengthwise over etouffee sauce. Spread half of the ricotta cheese mixture over noodles. Layer with one half of mozzarella over ricotta cheese. Spread remaining half of etouffee sauce mixture over mozzarella and sprinkle ¼ cup parmesan cheese. Layer another 6 lasagna noodles and remaining ricotta cheese, mozzarella and parmesan cheese. Cover with foil, making sure it doesn’t touch the cheese.